In this post we examine five of the best-selling handheld propane torches. A propane torch, or blow lamp, are handheld torches that use the hydrocarbon gas propane as fuel (Source). They're most commonly used in the construction, manufacturing, metal-working and construction industries (Source). These torch kits are also great for home use- scorching weeds, removing paint from non-flammable surfaces, and melting snow (Source). Anywhere you need a small torch with a strong, controllable flame. If you're looking for a trigger start propane torch, check out the Bernzomatic TS8000, the Greenwood, the Worthington and the Mag-Torch. The BernzOmatic UL2317 uses a turn valve and is the only hand-held burner that is manual as opposed to auto-start. If you’re looking for a top-rated propane torch, you might want to consider this one offered by Bernzomatic. Users love the reliability of this propane torch, but some do complain that the igniter went out quickly. This product is the hottest burning torch in the Bernzomatic line. It features instant On/Off trigger ignition which provides easier lighting and increased fuel savings. Other features include adjustable flame control, optimized large swirl flame and pressure regulation. The torch is made with a cast aluminum body for durability. This item might be a good choice if you’re looking for a propane torch with adjustable flame control that allows for easy switching between different applications. In general, buyers have a favorable opinion of the Bernzomatic High Intensity Trigger Start Torch. They agree that it has an incredibly hot flame for searing food, as well as that the lighter and control work flawlessly. Users appreciate that it is multi-fuel compatible and that the flame adjustment is precise. However, some buyers complain of the igniter which broke soon after the purchase. 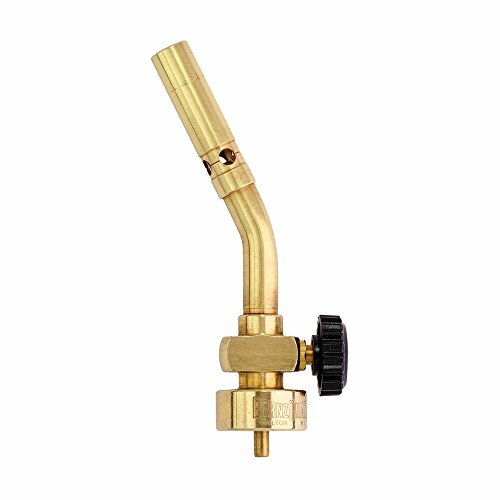 The Bernzomatic Brass Pencil Flame Propane Torch is a solid option if you want a basic pencil flame for small diameter soldering, thawing, melting and various heat applications. Users like the performance of this propane torch, but some complain that it stays lit only if it’s in vertical position. This product is a basic pencil flame torch head. It produces a 1/2’’ wide pencil flame for light work. The item is made from brass for durability and you start it manually. This item could be a solid choice if you want a propane torch with a flame control valve that easily sizes flame and extinguishes it when finished. In general, users state that the Bernzomatic Pencil Flame Propane Torch Head meet their expectations. They agree that this tool works great. Users state that the flow is highly adjustable from barely going to decently hot. One happy buyer shares that the flame is sharp and great for welding. However, some complain that it only stays lit if held vertically. The Greenwood Steel Nozzle Propane Torch could be a solid option for various applications, such as to burn weeds, melt snow or remove paint from non-flammable surfaces. Users like the powerful flame of this propane torch, but some do complain about hose and valve issues. This product features a turbo blast trigger for a burst of extra heat. It generates temperatures over 3000 F with ease when you connect it to any standard 20 lbs. propane tank. The torch features a durable steel nozzle jet, a flow valve and insulated ergonomic grip. This item might be a solid choice if you are looking fora propane torch for small jobs around the home that need a powerful flame. 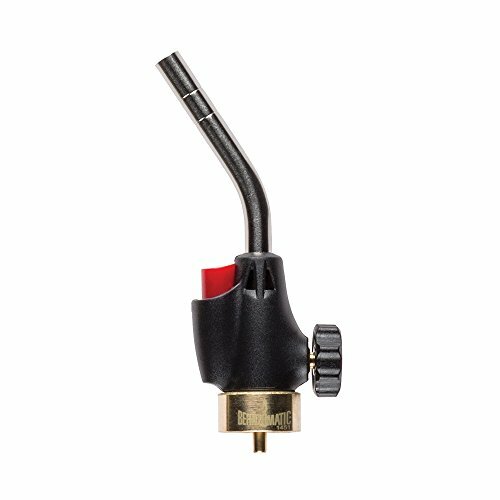 The general user consensus concerning the Greenwood Propane Torch with Turbo Blast Trigger and Flow Valve is that it is has a very powerful flame. Many buyers state that it is well-built and that it has a nice flow control. However, some buyers complain of a defective valve and poor hose. If you are looking for a propane torch, you might want to consider the Bernzomatic Trigger Start Propane Torch. Users like the efficacy of this propane torch, but some complain that the item stopped working soon after the purchase. This product is a basic propane torch with the built-in trigger-start ignition that easily ignites the flame. It features a versatile webbed flame, angled stainless steel burn tube and flame control valve. This product might be a handy item for a variety of household projects, including small diameter soldering, thawing and melting. In general, users have a good opinion of the Bernzomatic Propane Torch and they conclude that it ignites flame easily and has great range in intensity of the flame. However, there are others who state that the item worked for a very short time or didn’t work at all when delivered. The Mag-Torch Self-Lighting Regulated Torch might be a solid option if you want one with a stainless steel burn tube. Users like its efficacy, but some complain about the hard-to-turn-off knob. This product is a self-lighting torch with a brass adjustable flame control knob. It delivers the highest quality and consistent flame while operating the torch at any angle. The tough ergonomic handle provides comfort and durability. If you want a propane torch with a strong triple point flame, this item might be a solid option. 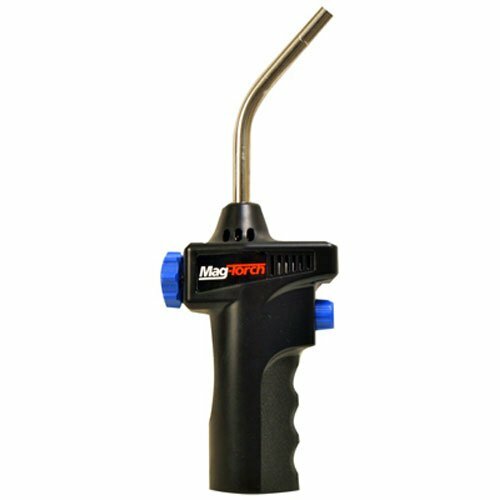 In general, users state that the Mag-Torch Propane Torch meet their expectations. They agree that this tool has strong flame and nice flame control. However, there are some complaints regarding the knob which you have to really turn hard to get it to turn off. Therefore, if you have hand or grip issues, users suggest getting a different product. Propane torches are used to merge copper joints in two components, a combination valve and nozzle assembly, and a replaceable metal tank of fuel. Screw the nozzle assembly to the threaded fitting at the base of the reservoir to set up the torch. One of the safest ways to lighten the propane torch is by striking a matchstick and keeps it close to the nozzle while turning the valve in a spiral position. Ensure you open the valve gently till the flame is sufficient for the particular work area you intend using it. The gas pressure which is in charge of the flame from the propane torch might be out of control if you do not calmly open the valve. Ensure the torch assembly is held in an upright way while in use to prevent the liquid content from moving into the valve as this might stop the flame from coming out. A propane torch can cause havoc if not properly used in the course of a project. 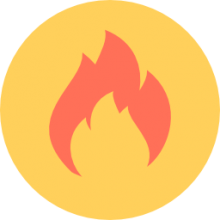 One of the safest ways to apply a propane torch is by ensuring the joints that are meant to be sweated with the flame are not far from the combustible regions of the work area. In the event that you’re seeking for the best priced, portable blowtorch, you can find these at Home Depot, Lowes, Ikea, Sears, Target, Harbor Freight, Menards, Ace Hardware, Walmart, Walgreens, and in many cases Costco. WHAT IS THE PROPANE TORCH USED FOR? Propane torches can be used to eradicate germs from the poultry as it remains one of the most important ingredients to disinfect poultry cages. Once the poultry is free from the attacks of diseases, food supply from it will be edible for human consumption. For housing structures with wired fences, propane torches can be applied to burn grass that emanates from under-wire fences. This torch can be used to heat asphalt, tar and roofing materials. Construction firms make use of the propane torch to dry sand, soil and other construction equipment. Propane torches are a valuable item that can be used to remove paint, grease, and plastic, oil from metal and non-flammable objects. It can be used to burn vast vegetation and rubbles located in culverts, pond edges, brush, stumps, brush piles, campfires and ditches. Propane torches are used to solder copper water pipes, merging different metals and welding applications by mechanics. They can be used to mitigate old paint and putty. Used to thaw frozen locks and rusted nuts in your home. Propane torches are excellent tools for soldering electrical and plumbing construction in the house. Used for cutting and welding of iron and steel. Propane torches can be used to remove snow from the entrance of the house. Eradication of rodents and weeds from your dwelling place. Propane is a colorless and odorless substance which must be properly kept to avoid trouble. For safety purpose, it is better to check for leakages on a regular basis. If you notice a surface is leaking, you can make a mixture of soap and water to know the exact point of the leak. Never make use of a flame to detect the occurrence of leakage. You can also make use of propane leak detectors to stay safe. Keep all propane containers away from sources of heat such as furnaces and water heaters. Dispose of empty cans properly and do not put those cans in a burning furnace. Ensure the torch burner is disconnected from the container. Make sure the work area is properly ventilated before using the propane torch. It is a known fact that propane is heavier than air. Ensure the gas supply to the burning torches is turned off before you disconnect the hose and burner. Do not smoke around propane or any equipment using it as fuel. Take off inflammable materials from the propane torch when in use.